Exciting News! 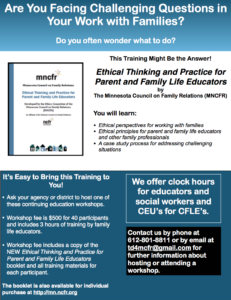 MNCFR’s Ethics Committee has recently updated the booklet. Information about ordering and training sessions is linked below. A multimedia resource kit with a Sesame Street DVD, a Guide for Parents and Caregivers, and a Children’s Storybook for children and families who are impacted by parental incarceration. Sesame Street: Incarceration app for adults to use on tablets and phones, available on Google Play, the App Store and the Amazon Appstore. Featuring playlists of videos related to the Sesame Street’s “Little Children, Big Challenges: Incarceration” Initiative.